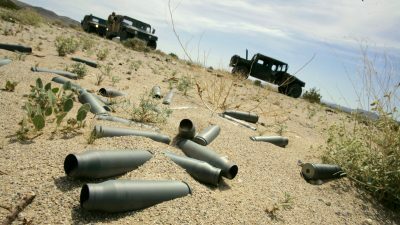 Producing more hazardous waste than the five largest U.S. chemical companies combined, the U.S. Department of Defense has left its toxic legacy throughout the world in the form of depleted uranium, oil, jet fuel, pesticides, defoliants like Agent Orange and lead, among other pollutants. Last week, mainstream media outlets gave minimal attention to the news that the U.S. Naval station in Virginia Beach had spilled an estimated 94,000 gallons of jet fuel into a nearby waterway, less than a mile from the Atlantic Ocean. While the incident was by no means as catastrophic as some other pipeline spills, it underscores an important yet little-known fact – that the U.S. Department of Defense is both the nation’s and the world’s, largest polluter. “Almost every military site in this country is seriously contaminated,” John D. Dingell, a retired Michigan congressman and war veteran, told Newsweek in 2014. Camp Lejeune in Jacksonville, North Carolina is one such base. Lejeune’s contamination became widespread and even deadly after its groundwater was polluted with a sizable amount of carcinogens from 1953 to 1987. However, it was not until this February that the government allowed those exposed to chemicals at Lejeune to make official compensation claims. Numerous bases abroad have also contaminated local drinking water supplies, most famously the Kadena Air Force Base in Okinawa. In addition, the U.S., which has conducted more nuclear weapons tests than all other nations combined, is also responsible for the massive amount of radiation that continues to contaminate many islands in the Pacific Ocean. The Marshall Islands, where the U.S. dropped more than sixty nuclear weapons between 1946 and 1958, are a particularly notable example. Inhabitants of the Marshall Islands and nearby Guam continue to experience an exceedingly high rate of cancer. The American Southwest was also the site of numerous nuclear weapons tests that contaminated large swaths of land. Navajo Indian reservations have been polluted by long-abandoned uranium mines where nuclear material was obtained by U.S. military contractors. One of the most recent testaments to the U.S. military’s horrendous environmental record is Iraq. U.S. military action there has resulted in the desertification of 90 percent of Iraqi territory, crippling the country’s agricultural industry and forcing it to import more than 80 percent of its food. The U.S.’ use of depleted uranium in Iraq during the Gulf War also caused a massive environmental burden for Iraqis. In addition, the U.S. military’s policy of using open-air burn pits to dispose of waste from the 2003 invasion has caused a surge in cancer among U.S. servicemen and Iraqi civilians alike. While the U.S. military’s past environmental record suggests that its current policies are not sustainable, this has by no means dissuaded the U.S. military from openly planning future contamination of the environment through misguided waste disposal efforts. Last November, the U.S. Navy announced its plan to release 20,000 tons of environmental “stressors,” including heavy metals and explosives, into the coastal waters of the U.S. Pacific Northwest over the course of this year. The plan, laid out in the Navy’s Northwest Training and Testing Environmental Impact Statement (EIS), fails to mention that these “stressors” are described by the EPA as known hazards, many of which are highly toxic at both acute and chronic levels. The 20,000 tons of “stressors” mentioned in the EIS do not account for the additional 4.7 to 14 tons of “metals with potential toxicity” that the Navy plans to release annually, from now on, into inland waters along the Puget Sound in Washington state. In response to concerns about these plans, a Navy spokeswoman said that heavy metals and even depleted uranium are no more dangerous than any other metal, a statement that represents a clear rejection of scientific fact. It seems that the very U.S. military operations meant to “keep Americans safe” come at a higher cost than most people realize – a cost that will be felt for generations to come both within the United States and abroad.